I’ll have the opportunity to talk about my book this afternoon on the national radio show, Prime Time America, on the Moody Broadcasting Network. The show is hosted by Greg Wheatley and reaches 5 million listeners. The 10 minute interview will be at 4:30 this afternoon. Tomorrow morning from 8:00 to 8:30 I’ll be a guest on the Gallo Show on Supertalk Mississippi. It is heard on a number of AM and FM stations around the state. It has been a joy to share about the book on regional radio stations over the past two weeks. And I always get opportunities (especially in the 30 minute interviews) to talk about Belhaven. Yesterday we wished Mrs. Harmon a 103rd happy birthday. Larry Mills, Assistant to the President, went to see her yesterday to wish her happy birthday from all of us. She still lives alone at 103 years old. Larry told me he went to see her after Thanksgiving last year and she was up the attic ladder getting out her Christmas decoration. Oh, to be 102 again! Mary Harmon taught home economics at Belhaven from 1952 until 1982. Today she is celebrating her 103rd birthday! She grew up in Goodman, Mississippi and graduated from “the W” in 1932 where she studied home economics. At the request of President Gillespie she joined our faculty in 1952 “to finish out a semester for another professor” She stayed 30 years, and of course, is a member of our Legacy of Learning Faculty honor roll. She taught our own Ms. Bettye Quinn at Belhaven. I know from reliable sources that Mrs. Harmon took most of her paycheck while teaching and put it right back into her classes. She especially loved the Dr. Ford choirs, and her classes would help make the costumes each year. Mrs. Harmon says that every morning she reminds herself that “this is the day that the Lord has made; let us rejoice in it.” That is a great way to live to 103 and make the most of each precious day the Lord gives us on this earth. 2. Our H1N1 report shows we are having about three students each week catch this flu. They are being cared for following our policy (posted earlier on this blog) and that seems to be helping us avoid the type of major outbreak that has come to many campus. Keep washing hands and using those hand sanitizers all over campus. We are hopeful of having the vaccine available soon for our students, employees, and their families. 3. If you haven’t read it yet, you must – there is a great article in “By Faith” magazine (Fall 2009) by faculty member Dr. Randy Smith who leads our creative writing program. It addresses the importance of Christian writers, and features Belhaven College. “By Faith” is the official publication of the Presbyterian Church in America. 4. In his blog, Reconcilers, Chris Rice remembers a very important conference held on our campus 12 years ago this week. This meeting brought together leaders from dozens of schools to address the issues of racial reconciliation on American college campuses. Little did we know that weekend, that when Spencer Perkins shared his ground breaking message calling for a “culture of grace,” it would be his final time to preach and he would die the following Monday. Chris is a great friend of Belhaven, as is John Perkins, Spencer’s father. Ms. Kathy Wooten, Assistant Professor of Accounting at Belhaven College, won first place in the Best Teaching Practices for Accounting competition, held at the Christian Business Faculty Association (CBFA) conference. This was Ms. Wooten’s first time as a presenter at the annual conference, which made her success all the more outstanding. Ms. Wooten’s presentation, entitled “Head, Hands and Heart in Managerial Accounting,” showed how professors can integrate traditional lecture methods, hands-on classroom experiences, and Christian principles into the classroom. She used her Managerial Accounting class as an example, where she recently had her students simulate a t-shirt factory in the classroom—making them responsible for everything from production line to quality control. This hands-on project gave the students a broader knowledge of accounting in “the real world,” and they had fun as they gained new knowledge. 6. At Belhaven, we continue to weather well the financial storm. The dollars are tight, but we’ve not had to cut any programs that impact the student experience, or lay off a single employee because of finance. But the Clarion Ledger reports that more difficult days are ahead for PUBLIC higher education in Mississippi. There has been some talk of a mid-year tuition increase at these schools. When I first proposed that Belhaven College start intercollegiate football a dozen years ago, a former NFL player pulled me aside to tell me it was impossible to be a Christian and play football. I strongly disagree. This past Saturday, our team played one of the most exciting games I’ve seen in a long time – although the final score was heartbreaking. Leading 20-7 with just two minutes left in the game, Cambellsville University scored a touchdown, got the ball back with an onside kick, and scored again with just seconds remaining on a fourth down and inches play. I happen to be on the sidelines at the goal line when they scored, and wanted to jump in and help as I saw their running back leap high over our line to extend the football so it would break over the goal line. Except for that last inch, our guys had put up an incredible goal line stand. I don’t normally go to the sidelines during a game, but had gone down with five minutes left in the game in anticipation of congratulating our coaches on their fifth consecutive win. I only know of one other time we’ve won that many games consecutively. But as I started off the field, I saw that not only had our team gathered in the middle of the field, but so had all the Cambellsville players (a Christ-centered school like Belhaven) – and they were mixing in together. As I began to get out of earshot, I heard Coach Thrasher congratulate Cambellsville on a great game…..and as I got to my car up the hill, I could see both teams praying together. Can you be a football player and keep strong your Christian life? Absolutely – and what I saw Saturday assures me you can. Be competitive, give full effort, play clean, play with emotion, and play to win. But when it is over, it is over and we are together in the eyes of the Lord and each other. For sometime I’ve been encouraged to take the time to write and share some of the leadership principles that have been important to me through 21 years in the college presidency. As our faculty, and others of you who write know, it takes discipline and it’s sometimes hard to stay in the chair long enough to get ideas onto paper. But with the encouragement of our Board of Trustees (they even put it in my annual evaluation to make this a priority) this three year project is now in print and was released last week. One of my great joys about the book is the opportunity to share the stories of how God has worked so marvelously at Belhaven through these years. David C. Cook is the publisher. They are working with B&B Media to help get out the word about the book, and I discovered last week that the daughter of the VP for B&B, Diane Morrow, is studying dance here at Belhaven – Amy Morrow. With their guidance I started a round of radio interviews last week, and there are more on the schedule – Detroit, Charlotte, Des Moines, Cleveland, etc. – I’ll be sharing on the American Family Radio broadcast to several hundred stations tomorrow with Matt Friedman. On Wednesday the 28th at 4:30 central time, I’ll have the honor to talk about the ideas of the book on the national broadcast of Prime Time America, on Moody Radio . I put in the campus mail today a signed copy of the book to each faculty and staff member because they make leadership easy for me at Belhaven. Thanks!! But if you’re not on the team here at Belhaven and would like a copy, it is on all the major book websites now, and will be featured in Family Christian Stores and in LifeWay Christian Stores during the month of November. Had some nice endorsements for the book including Ken Blanchard, Joni Erickson-Tada, Michael Lindsay, Ed Young, Steve Douglass, Duane Litfin, and Doug Birdsall. Since you know me, you won’t be surprised that some concepts run against the norm of traditional leadership thinking, such as the chapter: Planning Will Drain the Life from Your Ministry. This has been one of the hallmarks of distinction for Belhaven, and while our long-term faculty and staff lived through this dramatic shift, those who are newer may be interested to know the philosophy behind our not having a traditional long-range plan. The core focus of the book is on pages 11 and 12, calling us to break free from the immediate results driven culture that has taken over business – and permeated the church as well. 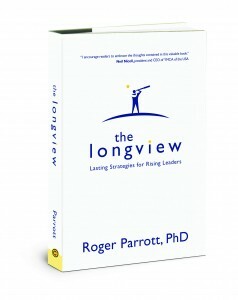 Our theology and our ministry passion draw us to talk about longview outcomes as our heart’s desire, but we have been duped into fostering a generation of leaders, board members, employees, and constituencies who value short-term gain over longview significance. Ministry leaders believe it and act accordingly—hiring and rewarding people who can promote Band-Aid fixes as monumental solutions, creating plans that promise the moon and always come up short, raising funds from unrealistically compressed donor relationships, and touting to boards and constituencies those results that can most easily be measured and applauded. Because this short-view corporate culture has so permeated the church today, we in ministry have loosened our grip on the biblical model for leadership. . . . The time is right for rising leaders to break free from the short-term leadership patterns of the past and set their sites on the horizon to ensure a life of leadership that will be honoring to God and bring us back to principles that will allow the church to make a transformational difference in the world. We need to be leading for significance rather than giving into the pressure for short-term results. This book not only calls us to this priority, but deals with the practical implications of leading for the longview. I’d welcome your feedback and insights. You can leave them here, or on www.thelongview.info blog. Wanting to Help the Flood Victims in India? Many times when we see news of disasters on TV we want to help, but don’t have a way to respond with help through someone we know and trust to use the money properly. A friend I’ve worked with in India sent me this email yesterday. If you have a heart to help with the India flood and don’t know how to make a gift that can be used well, Sam is someone in whom you can give confidently. Sam’s report of the flood is overwhelming – read below. He gets more ministry out of very little money than about anyone I know (he is on such a tight budget he doesn’t even have a web site) so I’m sure he’ll be thankful for whatever you’d like to share. His contact information is at the bottom of his email. The worst flooding in 100 years has hit the states of Karnataka and Andhra Pradesh in India. Over 300 people have died and over 10 million others are homeless. Transportation and electric power was cut off. People are suffering without food, drinking water, clothes and shelter. These floods effected over 30,000 Christian families and also many of Gospel Outreach Ministries church buildings/ shelters for the orphans and elderly widows. Hindus have cried out to their gods for help as they saw the flood waters rush by and wondered why their gods and goddesses did not help them. Some lost their small children while trying to cross to safer places. Unable to fight against the rushing waters, elderly people died. 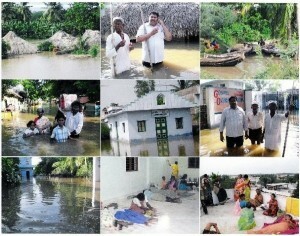 Loosing everything in the floods, some have committed suicide and died. Dead bodies of people and animals are submerged in contaminated waters. Many of the people who have survived the floods are suffering from fever, swelling and other waterborne sicknesses. Most of the crops were destroyed so there is no income for the poor that work the fields for a living. Cobra snakes are swimming in the waters to seek refuge in the palm tree roofs and biting people. Prices of food have escalated as crops were destroyed under water. Currently over 100 non-believers are receiving help and shelter at Gospel Outreach Ministries campus at Repalle, Andhra Pradesh. Our evangelists and Bible ladies are reaching out to them and ministering to them. They are showing “The Life of Jesus” movie in Telugu language with generators. At this critical time we earnestly request your prayers and financial help. We need extra funds to help the flood survivors with food, clean water, medicines, clothes, hygiene kits, blankets and a Bible. Please pray for Gospel Outreach Ministries Evangelists and Bible Women who are risking their lives taking this opportunity to reach out and touch the flood survivors with the love and Gospel of Jesus Christ. This summary report from CNN about a major study from the Pew Foundation shows the changing religious and cultural face of the world. (CNN) — Nearly one in four people worldwide is Muslim — and they are not necessarily where you might think, according to an extensive new study that aims to map the global Muslim population. On Friday we hosted on campus Mr. and Mrs. Raidy, who lead SPH International, a Foundation which is establishing 1,000 Christian schools in Indonesia. They are wonderfully gifted people who have a firm grasp of Christ-centered education, and have a heart for reaching their country through quality education. They also have established a UPH, a university of 16,000 students located in Jakarta. They were here to recruit teachers for their schools. We had over 100 of our students come for the information session. They need teachers who are certified. They would teach in English. They will pay a good salary, travel costs, provide housing, and even some “getting settled” money. This is a marvelous way for our graduates to have an international experience without needing to raise their own support. If you’re interested contact Budi Raharjo Legowo, Director of Administration (legowa@sph.ad.id) to apply. I was so impressed with this educational system and their heart for the Gospel – and solid Reformed theology. I’d strongly encourage our alumni to consider this unique opportunity to teach full time in Indonesia. 1. A one month educational experience for our current students in Indonesia. 2. Their 12th grade graduates enrolling at Belhaven. 3. Their university students studying for a year at Belhaven. 4. Our education majors doing their student teaching in Indonesia. God is so good to bring us together with Mr. and Mrs. Riady, and we look forward to building a significant partnership in the months and years ahead. I’m thankful to our mutual friend, Dr. Ric Cannada, President of Reformed Theological Seminary, for introducing Belhaven to Mr. and Mrs. Riady. 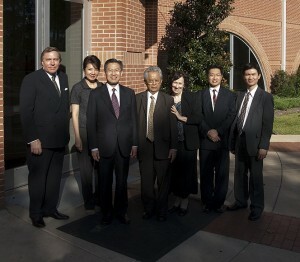 Also included in the photo are Dr. Jonathan Parapak and his wife, along with Dr. Perry Yang who directs the schools, and Mr. Legowo. I’ve periodically consoled coaches who are having a tough season in the win/loss column by saying, “losing builds character.” Which is true. But winning can build character too, if done right – and is lots more fun! 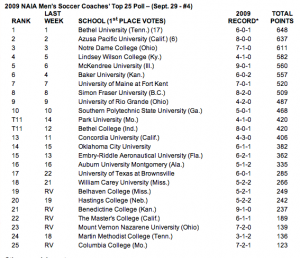 Belhaven men’s soccer (what the world calls football) moved into the top 20 national ranking this week, at #19. And with a big win on Saturday, Belhaven football is on top of the western division of the MidSouth conference. These two graphics below look mighty good!